I’ve carved out time, over the next month and a half to finish up something that I’ve been working on, and have given myself the deadline of September 1st. Even though I’m ahead of schedule, I feel like I need to pull up a new level of focus and commitment, because the closer I get, the more I seem to find other things that need my immediate attention. Like the other day, I was all set to work for 3 hrs; had my tea, fed the cats, went to the bathroom, turned off my phone, and then I picked up an old issue of O magazine and was going to put it on the shelf, but just glanced at it, noticed this set of knives and thought, “I’ve never had sharp knives. I need to check these out now.” After quite a search, and reading a lot of reviews on Amazon, I decided I should buy them….now, of course. If the internet had been around when Emerson was writing, I’m sure he would have added, “surfing the net”, to his list of “emphatic trifles”. Previous postSomething good is going to happen to you today! That is so funny Jenness..I called a friend this evening and she said, “when are you going to tell us what you are doing?” I was so surprised…It never dawned on me that anyone (on the blog) was curious about it….I decided that if I was going to make myself write a novel in 3 days (over Labor Day weekend…the novel contest) that I might as well give myself the summer, so that is all it is. Sending loving thoughts your way! These knives are so colorful and whimsical yet so useful. Almost a piece of art in themselves! How fun!I love them! Hopefully, your momentary knife distraction, actually helped to reset your focus on your project! Who knows how that colorful intermission impacted the creative part of you! For some reason, your brain had turned to the land of knives! And colorful ones at that! Happy chopping! Happy creating! They are whimsical looking aren’t they? I love them too! Oh, Mary, how TRUE!! As soon as I read this, I went on Amazon to look at the knives … hee, hee, hee! When I allow myself to be distracted, I recognize that there’s some hidden blockage to doing what I “should” be doing – I don’t like doing what I need to do, I don’t know how to do what I need to do, I’m afraid I’m going to fail at doing what I need to do … something’s preventing me. This is especially true when I have to iron!! I am new to your blog. I can certainly relate to this. I am always losing myself to things other than my intentions. But, sharp knives are important. Maybe your new knives will inspire you to ‘carve’ that special time for your project now that they are safely ensconced in their translucent holder – really pretty! Oh so tempting to go browse. . The day you talked about White Feather Farm being one year old, and the owl mug you found to celebrate – I went on Amazon and found an adorable owl mug with lid, strainer, and saucer and I use it every morning during WFF time. Little things can be so meaningful and fun. What great fun! 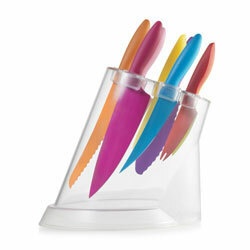 I perused, and considered and then ordered three of those colorful knives which I think will be useful in my kitchen. Since I use color coding for so many organizational tasks I think these beauties will never get lost in my knfe drawer and hopefully will not accidentally get tossed out with veggie scraps as have so many other of my favorite knives. Thanks a million for another great idea! Emphatic trifles – love that! And I have that routine down pat, as the basement can attest. Just can’t seem to make it down those steps to sort and pitch for all the “emphatic trifles” in my path! Spot-on post, Mary. You are always the great leveler for the WFF! Mary – I’d like to know how to keep away all those knocking at my closet door for even half an hour! Some days the distractions and interruptions seem endless. I have faith that you’ll meet your deadline. Maybe the knives and vibrant colors will serve as a catalyst for some wonderful idea or energy flow. I happened to see one of these knives for the first time over the weekend and thought the orange one glowed. Very cool knives! Congrats on your grand undertaking! A novel. Wow.Here’s wishes for time and incentive to do your work.To be published? We’d all snap it right up. You’re a wonderful writer Mary. I emphatically trifle endlessly and daily before a shower. I just don’t know why taking a shower feels like climbing a mountain to me! A Labor Day Weekend Writing contest…where’d you hear about it? I haven’t been reading or writing blogs much this summer. Did I miss something? All power to you, Mary. I admire that you continue to write your blog Mon. thru Fri., while also writing a novel. I would love to read it; if you win, or not; published or not. Sharp well chosen words are more valuable than sharp knives…and can be more cutting! I trip over trifles on my way to dusting my room! 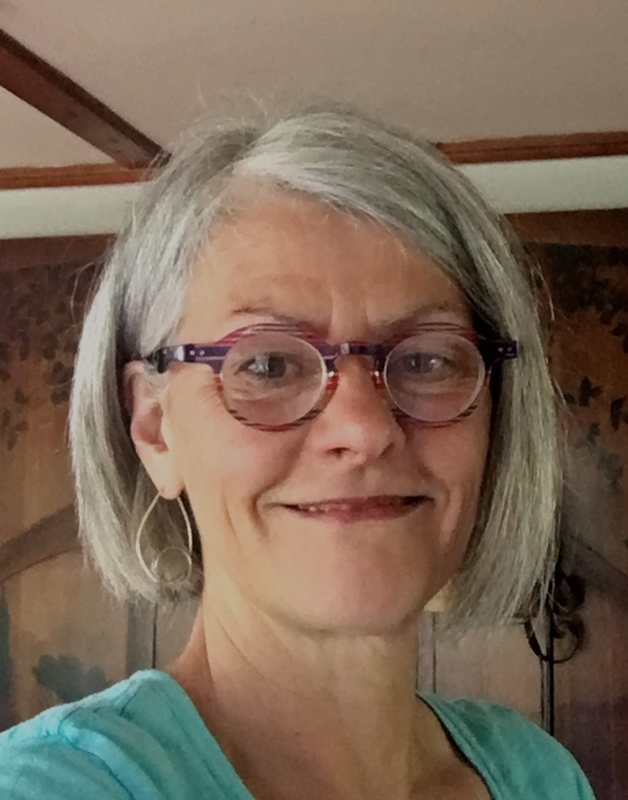 As a matter of fact, not to refer to your blog as a trifle, Mary, but reading and responding to White Feather Farm is part of what I am doing instead of climbing the mountain of dust in my bedroom. But, I must since my nose knows where the dust hides; I have been suffering from post-nasal drip due to dust and animal dander. Dust I Must!! !